Urea-formaldehyde resin adhesive is one of the early development and application of polymer adhesives. It has the advantages of simple production process, wide source of raw materials, low cost, and easy use. It is widely used in bamboo, wood processing, paper bonding, tempered coatings and other industries. An adhesive. With the development of wood industry, the amount of urea-formaldehyde rubber is very large, but there are also disadvantages such as high free formaldehyde content and brittleness. In recent years, a large amount of modification work on urea-formaldehyde resin binders at home and abroad has greatly improved the performance of urea-formaldehyde adhesives. Here, we chose oxidized starch for urea-formaldehyde modification experiment. Due to the complex factors affecting the urea-formaldehyde resin modification experiment and the contingency of the experimental results, the data obtained will inadvertently introduce some irrelevant variables, thereby increasing the number of variables. The main factor analysis method can analyze and process a large amount of experimental data, enrich the information, and reasonably combine the relevant variables to reduce the number of variables, eliminate non-essential factors, and find out important information and laws. The use of the main factor method to analyze the influence of certain factors on the specific properties of the modified urea-formaldehyde resin has important guiding significance for further research and improvement of the process and formula in the production process and the improvement of the performance of urea-formaldehyde resin. 500ml milled three-necked flask and other glassware and water bath set: 25W stirrer: BP-II type 500g tray balance; TS14-2 type analysis is equal. Urea, 95% (Lutianhua); Formaldehyde, 36% (Siwei Plant); Chemically pure hexamethylenetetramine ((CH2)6N4); Starch, etc. 175 ml of formaldehyde and a certain amount of hexamethylenetetramine were added to the three-necked flask to start heating in a water bath. When the temperature rises to 55Â°C, the first batch of urea is added to 40g (40% of the total amount of urea). When the reaction reaches a certain pH value, add the second batch of urea 50g (50% of total urea), maintain a certain pH (adjusted with acid or base), wait until the desired viscosity, adjust the pH to 6.7, add The remaining 10g of urea was reacted for 20 minutes and the pH was adjusted to 8 to cool the material. Immediately after the second batch of urea was put into the oxidized starch. In this experiment, the input of oxidized starch was 30% of the total amount of urea (calculated as dry starch measurement). This work focuses on the characteristics of large experimental data volume and many influencing factors. The main factor analysis method is used to eliminate the relevant variables and enrich the information. Experimental data processing According to experimental data and main factor analysis target design matrix, this work uses MATLAB 5.3 programming to standardize the initial matrix of the design, find the correlation matrix of the standard matrix, get the feature vector and feature value, and the feature value In descending order, the cumulative percentage of the current n feature values â€‹â€‹is greater than 95%, then the remaining remaining feature values â€‹â€‹are omitted, the initial factor load matrix is â€‹â€‹obtained, and then the matrix is â€‹â€‹subjected to a maximum orthogonal rotation of the variance, and the final result is obtained. 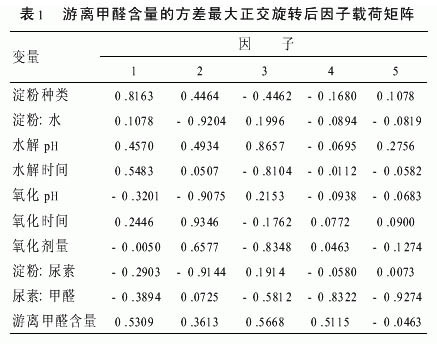 From Table 1, it can be seen that Factor 1 is composed of starch species, and Factor 2 is mainly composed of several factors, including starch to water ratio, oxidation time, oxidative pH, and the ratio of starch to urea. Factor 3 mainly consists of hydrolysis time. The hydrolyzing pH and the oxidant content were linearly composed. Factor 4 and factor 5 were composed of urea-aldehyde ratios independently. The free formaldehyde content has non-zero load on each factor, so the five factors have an effect on free formaldehyde content, but factors 1, 3, and 4 have a greater impact on free formaldehyde content, and factor 3 has the greatest effect. That is, starch type, hydrolysis time, hydrolysis pH and oxidant amount, and urea-aldehyde ratio have a great influence, and hydrolysis time, hydrolysis pH, and oxidant amount have the greatest impact. That is to say, the urea-aldehyde ratio, which influences the free formaldehyde content in the common urea-formaldehyde resin, also has a great influence on the free formaldehyde content in the urea-formaldehyde resin modified by the oxidized starch, but the most influential is that the starch is hydrolyzed and oxidized. degree. The influence of urea-aldehyde ratio has been discussed in many literatures. Here, the effect of oxidation time is taken as an example to discuss the degree of modification of starch. Figure 1 shows the effect of oxidation time on free formaldehyde content with a certain amount of oxidant. From the figure we can see that with the extension of oxidation time, the degree of oxidation of starch is increased, and the content of free formaldehyde in urea-formaldehyde resin is also increased accordingly. When the starch is oxidized, the hydroxyl groups on the C6 side of the glucose units in the structure are converted into aldehyde groups, and the aldehyde groups can form hemiacetals and acetals with the hydroxyl groups in the urea-formaldehyde resin under the curing agent and heating conditions. Thus, a cross-linked body structure having an oxidized starch chain is formed during curing, which effectively prevents the progress of permeation and improves the performance of the urea-formaldehyde adhesive. With the increase of starch oxidation degree, aldehyde groups are further oxidized to carboxyl groups. The reactivity of carboxyl groups with amino and imino groups capable of reducing the free formaldehyde content is higher than that of formaldehyde, resulting in an increase in free formaldehyde content of the final product.